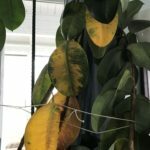 What types of other plants can be grown in the same pot as my rubber tree plant? Almost any tropical houseplant can be grown with a rubber tree plant. Many tropical houseplants, like pothos, mother-in-law tongue, peace lily, cast iron plant and dracaena have similar light and water needs.